gprMax is open source software that simulates electromagnetic wave propagation. 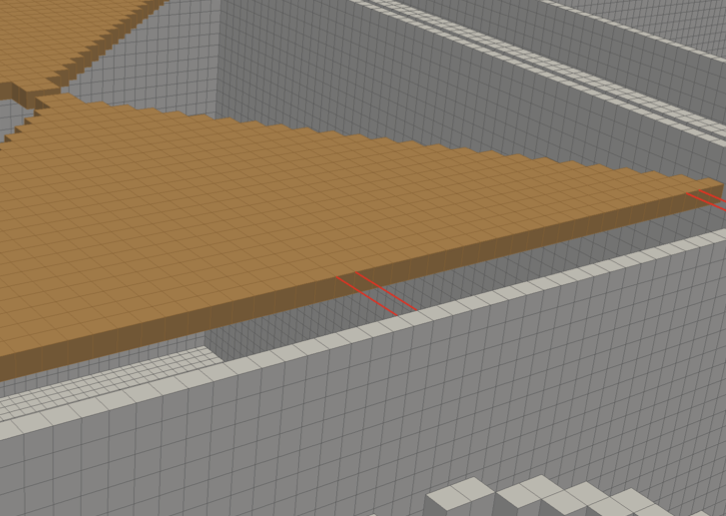 It uses Yee's algorithm to solve Maxwell’s equations in 3D using the Finite-Difference Time-Domain (FDTD) method. The finite difference expressions for the spatial and temporal derivatives are central-difference in nature and second-order accurate. It is designed for simulating Ground Penetrating Radar (GPR) and can be used to model electromagnetic wave propagation in fields such as engineering, geophysics, archaeology, and medicine. There are a wide range of applications including: assessing critical infrastructure such as bridges and roads, locating buried utilities, mapping glaciers, finding anti-personnel landmines, and detecting tumours in the human body. gprMax is command-line-driven software written in Python with performance-critical parts written in Cython. It currently does not feature a graphical user interface (GUI) which allows it to be very flexible and scriptable software that can run in high-performance computing (HPC) environments, i.e. on supercomputers. gprMax can be run on either CPU or GPU. The CPU solver has been parallelised using OpenMP which enables it to run on multi-core CPUs. The GPU solver has been developed using the NVIDIA CUDA programming model. gprMax also features a Messaging Passing Interface (MPI) task farm, which can operate with CPU nodes or multiple GPUs. All of the software features along with examples are described in detail in our comprehensive User Guide. 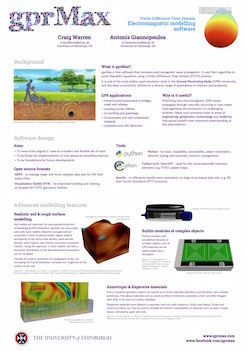 Take a look at our poster from the 8th European Conference on Python in Science (EuroSciPy) which showcases some of these features. 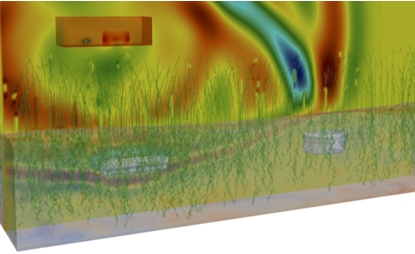 gprMax was originally developed in 1996 by Dr Antonis Giannopoulos when numerical modelling using the FDTD method and, in general, the numerical modelling of Ground Penetrating Radar (GPR) were in their infancy. It was written in C and continually improved and extended until 2015. This original (v.2) release of gprMax consisted of two simulators: gprMax2D - which solved the transverse-magnetic mode with respect to \(z\) (\(TM_z\)) in 2D; and gprMax3D - which solved the full FDTD algorithm in 3D. It was supported by the Building Research Establishment. The previous version (v.2) of gprMax is no longer maintained or supported. Developed by researchers in the School of Engineering at The University of Edinburgh, and in the Department of Mechanical & Construction Engineering at Northumbria University. Funded by Google and The Defence Science and Technology Laboratory (Dstl), and a contribution to COST Action TU1208 'Civil Engineering Applications of Ground Penetrating Radar'.